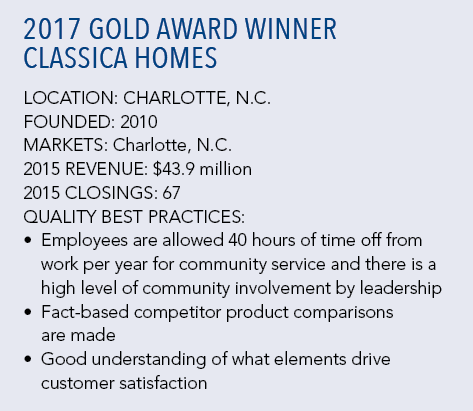 Classica Homes, in Charlotte, N.C., winner of a gold award in the 2017 National Housing Quality Awards, has a quality management system in place that can turn mission statements into reality. Eight subcontractors and building material suppliers sat around the Classica Homes’ conference room table to meet the NHQ judges. 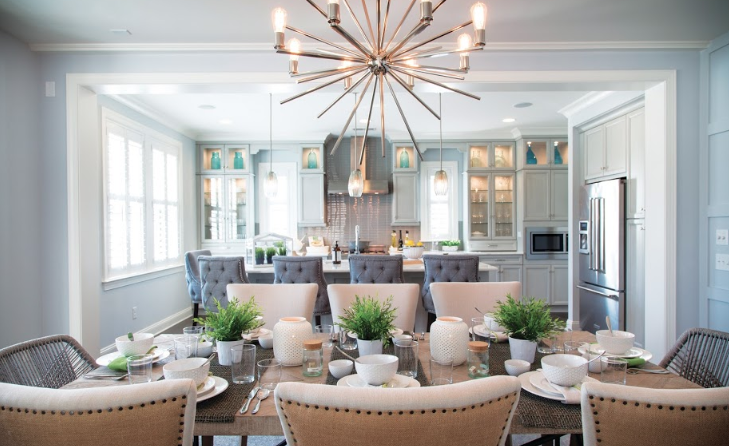 Many of these representatives have been with the builder since the Charlotte, N.C.-based company opened in November 2010 and previously worked with Classica managers for a decade or more when they did business with Simonini Builders, which closed. “They have the best understanding of building science of anyone in this town,” says one subcontractor. The electrical contractor added that when Classica says a house is ready for roughing in, “I trust Classica 98 percent of the time. The other builders, maybe half the time. Sometimes I’ve gone out to [other builders’] jobs and the house is not there or the second floor isn’t framed.” The landscaper related that he forgot to bill Classica for constructing a retaining wall. The builder caught the oversight and paid the bill immediately. Indeed, all trades are paid every 30 days. Several more minutes ensued with the visitors telling the judges about what doing business with the company was like. “Classica is clearly the builder of choice with trades and suppliers,” the judges wrote on their feedback report for the 2017 NHQ Gold Award winner. The award validates that the winner has a quality management system in place that can turn mission statements and broad strategy into execution. As far as the trades were concerned, Classica was making good on such core company values as teamwork, doing what’s right, and delivering. Key managers for Classica Homes, NHQ Gold Award winner, include (front row, left to right): Terri Saint, VP-Design; Bill Saint, President and CEO; Terri Fowler, VP-Finance; (back row, left to right): Brian Hall, VP-Construction; Rick Jasinski, VP-Land Acquisition & Development; Chuck Graham of Newton Graham Consultants. 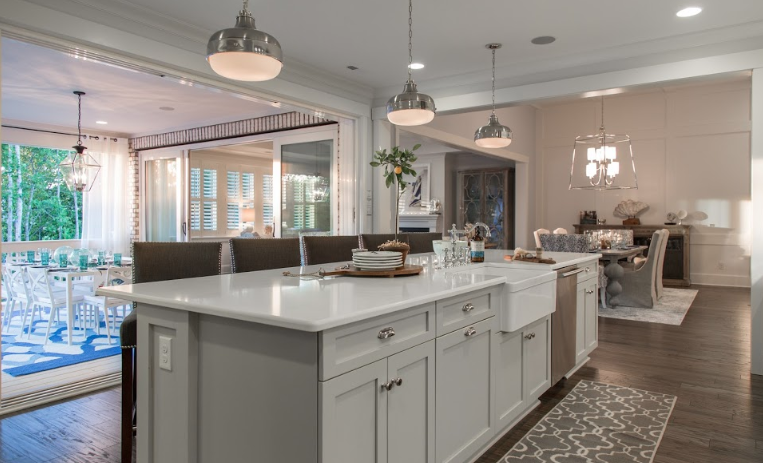 The semi-custom home builder closes about 70 houses per year. Its managers set a goal to build 100 homes in 2018 and have a 10-year vision to close 300, expand into another market, and maybe even have townhomes in the mix. To get there, they will use the same Traction methodology—based on a best-selling business book of the same name by Gino Wickman—to identify strengths, weaknesses, and needs that previously prompted Classica to get out of building houses in the $600,000-plus range coming out of the recovery and into the $450,000 to $550,000 market, which had three times more buyers. 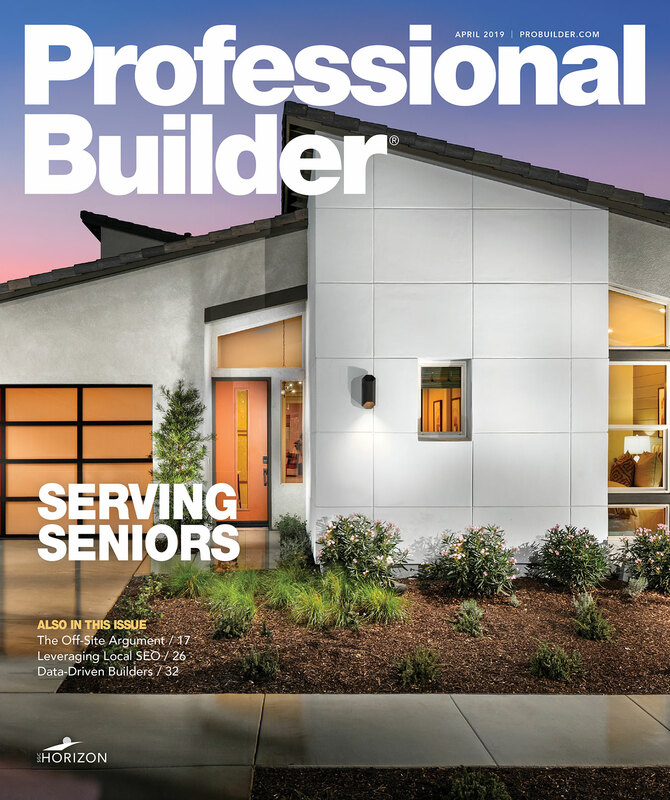 The ability to adapt—another core company value—was demonstrated by hiring Bassenian Lagoni, in Newport Beach, Calif., to design a new product line of lower-priced homes, and additional skill sets were added by bringing in a new superintendent and purchasing manager. Sales and gross margins have steadily improved since 2013, and Classica is aiming for $50 million in annual revenue in 2018. • The sophistication of Classica’s market intelligence was lauded as a “competitive strength.” The cloud-based IT system, called Structure, is customized by a full-time programmer for deep data gathering. For example, each month, multiple listing service data—which includes information about competitors’ houses—are dumped into the database and sorted to identify market opportunities. Sales leads are entered into the system, which triggers email follow-up messages and tracks all feedback from prospects. Structure also is used to track visitor traffic to Classica’s model homes from five different sources, as well as behavior on Classica’s website such as mouse tracking and other analytics. Any data, whether a client name, a price for an option, or a promised delivery date, only needs to be fed once into the Structure system. That information is then automatically linked to the company website, contracts, change orders, and so on, eliminating the risk that new information isn’t being transferred from one document, system, or process to another. Structure includes the warranty portal, so a warranty manager can go into a file months after a house was built and pull the plans, engineering report, selections, and more. The platform also accommodates the online construction schedule that is shared with the trades and enables the partners to see what’s ahead of them for the next six weeks with real-time updates when inspection delays or weather force changes. • The Client Playbook was cited as an industry best practice. The three-ring binder is given to clients at contract signing and grows as they move through the sales, design, and build stages. Among the literature included is the Homeowner’s Companion Manual, which educates clients by outlining the sales, construction, and warranty process. In all, the Playbook will hold the contract, specifications, site map, landscape plan, mortgage information, utility service, design selections, change orders, and HOA guidelines. • The judges noted Classica’s customer-centric culture. 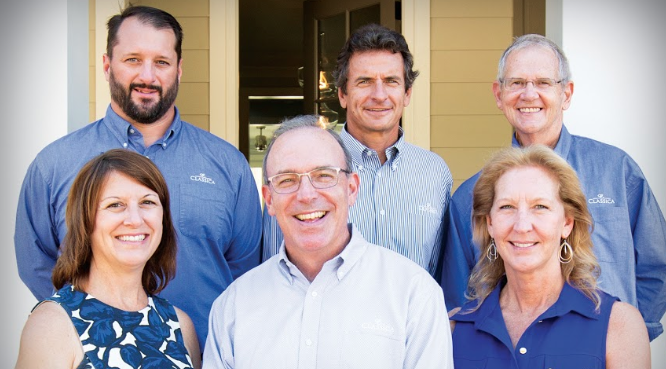 The leadership team reviews the status of every client’s home under construction in weekly meetings, and with roughly 30 houses under construction at a time, it’s small scale enough to enable managers to see clients at their home, the sales office, the design studio, and the field. Consequently, they hear about the customers’ experiences and any complaints firsthand. The builders also communicate weekly with clients, and Saint routinely sends email to customers asking how their recent meeting went and requesting feedback. That harvest of buyer sentiment and opinion has been used for product development. 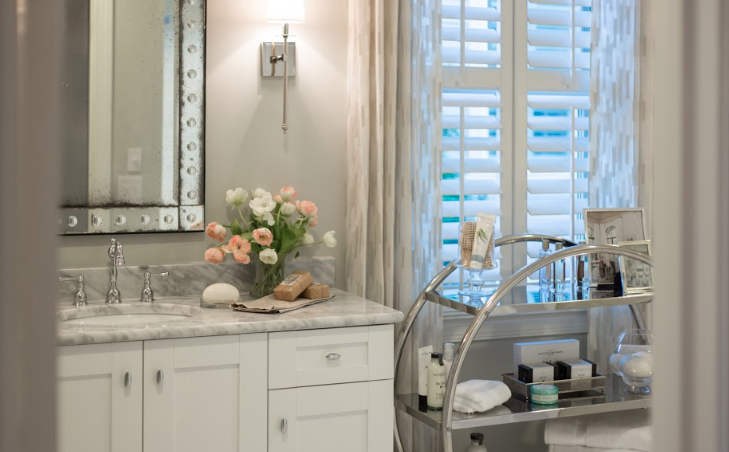 Among the changes implemented: replacing shower pans with tile, adding hardwood flooring to previously carpeted areas, and providing walk-in storage space. Read about the other 2017 NHQ Award winners.